ABS-CBN TVplus users can look forward to exciting and fun mornings as its all-day movie channel CineMo airs Sorpresaya, the first game show on digital TV that travels around provinces in Luzon to reward audiences with loads of cash prizes through its entertaining segments. Kapamilya ‘komikeros’ Jobert Austria (left) at Nonong turn into hosts for 'Sorpresaya,' CineMo's first game show. “We have a lot of segments that are funny and enjoyable,” said Jobert Austria, the host of Sorpresaya. 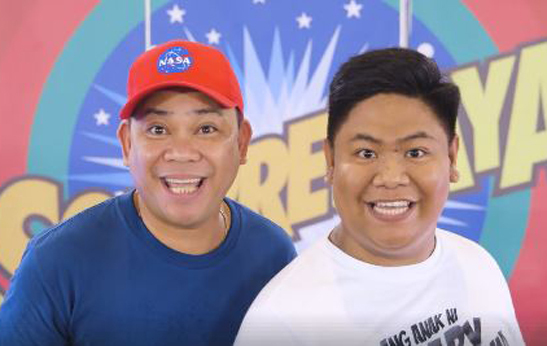 Joining Jobert in spreading happiness is fellow comedian Nonong who speaks fondly about their friendship. “Our strong bond was established because of the shows we have done together,” Nonong shared. Jobert and Nonong both headline another CineMo program, Sagot Ka Ni Kuya Jobert. Both “komikeros” also have shows in the Kapamilya network. Completing Jobert and Nonong’s tandem is It’s Showtime “Miss Q & A” finalist Elsa Droga who adds humor in the new game show as a co-host. Airing on weekdays at 10:30 a.m. with a same-day replay at 10:30 p.m., Sorpresaya features seven games that audiences can join. One of their major segments is “Wanted,” a thrilling game that picks a winning player from a pool of 20 randomly selected audience members who meet four qualifications. If none of them meets the qualifications, the jackpot prize will continue to grow bigger until a winner emerges. Sorpresaya also features an imitation game called “Chick Boys” that is only open to lesbians. In the segment, the player that shows the best impression of a famous Pinoy movie character from a film that has aired on CineMo will be hailed as the winner. The CineMo show Sagot Ka Ni Kuya Jobert is also now a segment in Sorpresaya. Three audience members who want to ask Jobert Austria, one of the hosts of the new game show, will take home P500.